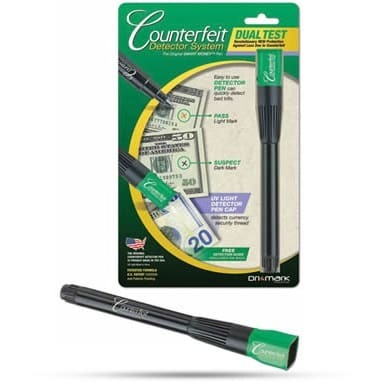 The counterfeit detector offers two tests in one device to guard against counterfeit bills. One end has a counterfeit detector pen, and the other end has an extra low spectrum, ultraviolet LED light. You can mark U.S. paper currency with the pen, and the color of the mark will indicate if the bill is suspect. Use the powerful ultraviolet light to check for the UV sensitive thread's found in notes printed in 1996 and later. The UV light can also be used to check authenticity of credit cards, personal and traveler's checks, foreign money and more.